Australia’s revolutionary passports have been given the Wako treatment in Japan. No, that’s not a spelling mistake (it’s pronounced Wah-Koh, not whacko), nor does it mean Down Under travel documents are being held up to ridicule. In fact, Wako University, a tertiary institution located in the outer Tokyo suburb of Machida, typically uses posters hung up in the carriages of capital area trains to provide a short lesson for commuters. The university’s current poster focuses on how Australia now deals with the issue of gender when it comes to issuing passports. 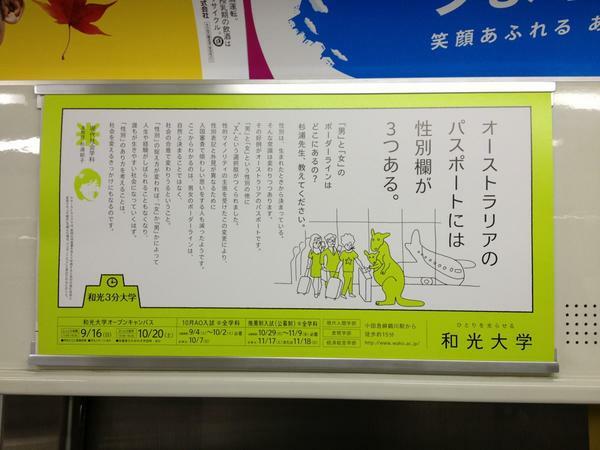 The distinctive yellow posters, effectively an advertisement for the privately funded university, feature a kangaroo with joey and people traveling through what is probably supposed to be Immigration Control at an airport. The posters hail the Australian practice of allowing passport holders to state their gender as either “male,” “female” or “X” is being held up as a virtuous practice that signifies changing recognition of societal norms. Wako is probably best known in Japan for rescinding an entry offer it made to one of the daughters of Shoko Asahara in 2004. Asahara, of course, was the Aum Shinrikyo cult guru convicted for masterminding the 1995 Tokyo Subway Sarin Gas Attacks that killed 12 and left thousands more sickened. While the university may preach tolerance and show support for it in things like the posters, it doesn’t always necessarily act that way. Incidentally, the president of the university at the time had just published a book expressing outrage at discrimination. Gender is decided from the moment we’re born. But that accepted thought may be about to change. A good example of that comes from Australian passports. As well as ‘man’ and ‘woman,’ they also have a selection option of ‘X’ to describe gender. This change was brought about in response to claims made by sexual minorities and to limit discomfort at Immigration Control when the stated gender and external appearance differed. Wako University’s airport kangaroo and joey. What we learned from this is that people on the borderline of being a man or woman are not decided naturally, but can change if society concurs with that. If we change our conceptions of what constitutes gender, we’ll no longer see our lives or experiences bound by perceptions of what a “man” or “woman” should be and become that kind of society where anyone can live. Thinking about what gender is can provide an opportunity to change society.